Phase I: Diagnostic study of Lake Vermilion, Vermilion County, Illinois. The Consumers Illinois Water Company applied for and received a grant to conduct a diagnostic-feasibility study on Lake Vermilion commencing in May 2000. 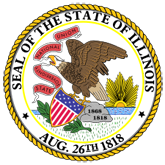 Lake Vermilion is a 878-acre public lake that serves as the public water-supply source for the City of Danville and surrounding communities in Vermilion County, Illinois. The lake is located in the Second Principle Meridian, Township 20N, Range 11W, Section 31 one mile northwest of the City of Danville. Lake Vermilion has a maximum depth of 21.8 feet, a mean depth of 9.1 feet, a shoreline length of 14.3 miles, and an average retention time of 0.042 years. The Lake Vermilion watershed, including the lake surface area, is 190,720 acres or 298 square miles. The main inflow tributarary is the North Fork of the Vermilion River. The diagnostic study was designed to delineate the existing lake conditions, to examine the causes of degradation, if any, and to identify and quantity the sources of plant nutrients and any other pollutants flowing into the lake. On the basis of the findings of the diagnostic study, water quality goals will be established for the lake and a restoration feasibility study will be conducted by Cochran and Wilken, Inc. of Springfield. Under the feasibility study, alternative management techniques will be evaluated in relation to the established management goals. 1. Phase I: Diagnostic study of Lake Vermilion, Vermilion County, Illinois. (20061005194721_ISWSCR2005-10.pdf).